Since it was launched by the UN Secretary-General Ban Ki-moon in September 2010, Every Woman Every Child has demonstrated the value of multi-stakeholder partnerships, elevating women’s and children’s health to the top of the political agenda, and guiding stakeholders from all sectors to achieving great progress on women’s and children’s health. 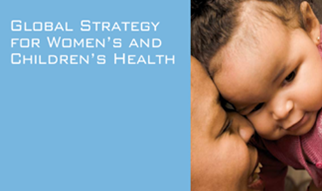 More than 300 partners representing governments, civil society, the private sector, philanthropy, and international organizations have made over 400 commitments in support of the Global Strategy for Women’s and Children’s Health (Global Strategy). Accountability for resources and results, in particular, has been a cornerstone of this movement. As we are in the final year of the Global Strategy, and as we look to transition women’s and children’s health from the Millennium Development Goals (MDGs) to the Sustainable Development Goals (SDGs), it is important that we receive an update on progress that has been made on all commitments to the Global Strategy. As such, we have developed an online questionnaire for all commitment makers to report back on progress that has been made to date on your commitment. Completion of this questionnaire is important to ensure accountability and transparency continues to drive advancement on women’s and children’s health. Your submissions will be used to showcase progress on the Every Woman Every Child website and will be placed on your organization’s individual commitment page. Additionally, they will inform a Progress Report on the Global Strategy 2010-2015, which will be launched this March during the Commission on the Status of Women and Beijing+20 review. In addition to the survey, if you would like to update your commitment page with any supporting information (i.e reports, infographics, videos, photos, etc.) please send it to everywomaneverychild@unfoundnation.org. Kindly note that all responses need to be submitted by Friday, February 20, 2015 to inform the Progress Report. Please contact Caitlin Richardson, at crichardson@unfoundation.org for any questions. The Progress Report is one of the many work streams the Every Woman Every Child community is leading on this year to lay the foundation for an updated Global Strategy for Women’s, Children’s and Adolescents’ Health for 2016-2030, to be launched during the SDG summit this September. More information on these processes and products is available HERE. Thank you for your contribution and continued support to improve the health of the most vulnerable women and children around the world. We look forward to working with you to achieve our collective goal of ending all preventable maternal, child and adolescent deaths within a generation.